When you get a new camera, you're anxious to start using it. With the Nikon D5100 DSLR Deluxe Kit with 18-55mm VR Lens from B&H, you can shoot from day one with confidence. Not only does the 2-Year Protection Plan give you peace-of-mind, but the included screen protector lets you shoot with confidence. A scratch on that beautiful 3.0" LCD screen will be one thing you won't have to fret while out photographing. The other included accessories do their part to relieve anxiety as well, allowing you to simply focus on the joy of photography. The additional items in the kit are as follows: one 16GB memory card, a spare battery, a camera case, a wireless remote, a battery grip, a UV filter, a circular polarizer filter, a lens cap holder and video production software bundle. 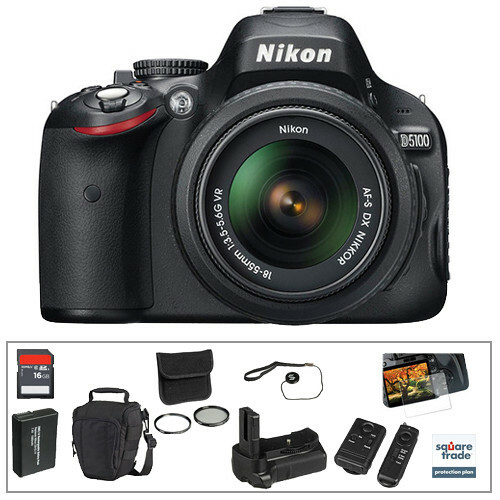 Of course, this wouldn't be the D5100 Deluxe Kit without the Nikon D5100 and the 18-55mm VR lens included as well.